More than 7,000 festival-goers recently set a Guinness World Record The Most People Tagged in an Online Photo. (CNN) -- More than 7,000 festivalgoers recently set a Guinness World Record -- simply by logging on to Facebook. 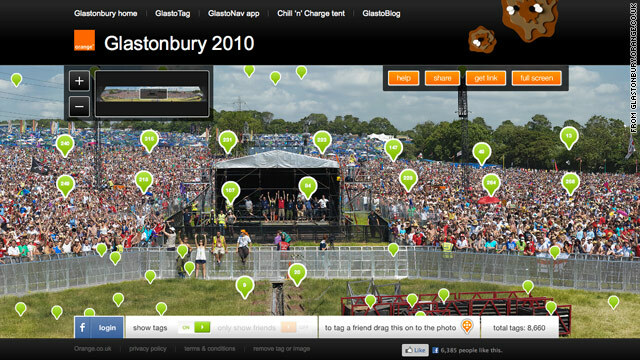 Orange, a popular global mobile-network operator, attempted to set the record for "most people tagged in an online photo" during England's Glastonbury festival in June. They succeeded, racking up more than 7,000 tags on a panoramic crowd photo that captured about 70,000 people, according to tech blog Gizmodo. Multiple hi-res photos snapped from the festival's Pyramid Stage on June 23 were later stitched together, creating "one huge photograph," according to the GlastoTag website. Festivalgoers were then able to zoom in close enough to identify people in the crowd and tag themselves and their friends. "Tagging" is the method of identifying someone in a photo posted online, most often on Facebook. The Glastonbury festival, a hugely popular annual event in England, attracts leading pop music acts and was headlined this year by Gorillaz and Stevie Wonder.